A handsome house dating to 1911 was home to a real baby circus elephant. The home base for Hill’s Society Circus, one of the many small family-owned circuses that toured the country during the 1920s and 30s, was a spacious Arts & Crafts house built in 1911 in Mountain Lakes, New Jersey. It was convenient to the train, every circus’ mode of transport from town to town, and the property included a carriage house and barn that, in the winter, when the circus was not touring, housed the animals. A legend holds that a monkey escaped into town, still a favorite local story. A less amusing event was the fire that broke out in the carriage house, destroying a baby elephant’s quarters. In order to keep the pachyderm warm, it was brought into the house, where it spent the winter in the dining room. The elegant dining room has a picture rail wainscot and parquet flooring. Hopefully, the baby elephant appreciated the architectural warmth. Today the house – sans baby elephant – is for sale, a gracious survivor from over 100 years ago. Important original architectural details include hardwood parquet floors, molding and wainscoting made from superb — and now extinct — American chestnut, coffered and beamed ceilings, French doors and vast windows that fill every room with natural light. 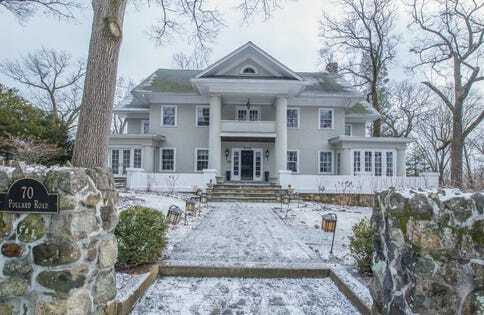 With five bedroom, three full bathrooms and one half bath, the house has two fireplaces, an eat-in kitchen, a media room, sunroom and full basement. The entire third floor has been converted to become an entertainment center, with a media room and music studio. The kitchen is furnished with granite countertops and stainless steel appliances, including a top-of-the-line Thermador stove and ovens. The half-acre lot includes a connected three-car garage, a deck, patio and a fire pit. The upscale surroundings are wooded, private and full of natural beauty. The home has the ideal mix of historic elements and the amenities today’s homeowner values, including multi-zone heating and air-conditioning, a built-in underground sprinkler system, automatic garage door openers and a basement workshop. The house at 70 Pollard Road is offered for sale by Sueanne Sylvester of Coldwell Banker. The elegant dining room features oak picture-rail wainscoting, parquet flooring and a heavily beamed ceiling. But alas, there is no baby elephant.